Usha’s range of personal coolers is light, zippy and stylish to the tee. Best for spot cooling, they can be placed in any corner of the room or directly by your side when you require a personalized cooling experience. These coolers are a not just a great fit aesthetically but also provide convenience with their ease of portability. Powerful spot cooling combined with a big tank for a long lasting cooling experience make these personal coolers a must have for cooling off this summer season. 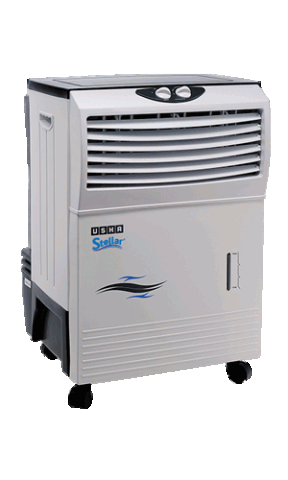 Stellar+ boasts superior in class performance with its 3-side honeycomb panel, powerful airflow and ice compartment. This cooler is compact, portable and makes for an amazing personalized cooling experience. Stellar is compact, portable and has a powerful airflow. Despite its 1 –side honeycomb pad, it promises the same amazing cooling experience as its other variant. This tabletop-cooler is the best cooling companion if there ever was any. 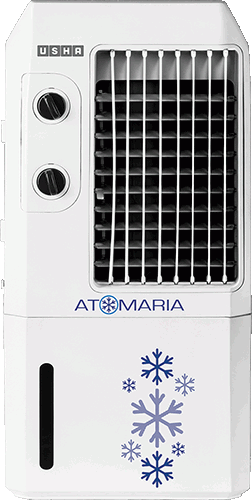 Small, compact and with a modern design, Atomaria is super portable and can provide direct cooling while being easily carried around going from room to room. Additionally, its performance is such that it is a great fit even when used in cramped spaces like the kitchen or a puja room. © 2019 Usha International Ltd.